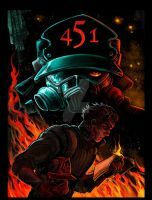 This is a piece I did in acrylic on Illustration board; it was an illustration project for a book cover jacket for Ray Bradburys book Fahrenheit 451. The story is set in the future where it is illegal to own and read books. Still a favorite story. It was instantly recognizable. i agree. I love this novel so much! Amazing! I bow down to you, dear companion! It is really good, I like it very much. I think the only thing that gets me is that though it is set in the future the drawing has obsolete turnouts. Could I possibly use this in a class speech I'm doing on Fahrenheit 451? It's absolutely brilliant! You, of course, would receive all the credit for your gorgeous artwork. This is a truly amazing piece of work. This is great, fantastic color choice. Amazing! You really captured the intensity of the fire!